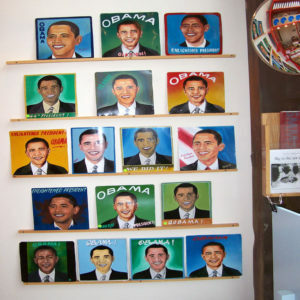 Folk Art ObamasThe Folk Art Obamas Barack Obama was elected with great excitement all over the world. Nepal was no exception. The artists were happy to paint his portrait. 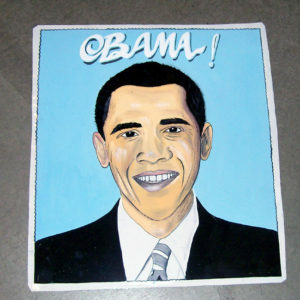 They all called him Barack Hussein Obama.I gave them a choice of 4 photos to paint and here are the results! All are enamel on metal except for one by Govinda which is on wood panel. All are available for $300. Or contact the Santa Monica Museum of Art at smmoa.org. One thing about this fair trade art project is that you never know what will come out. 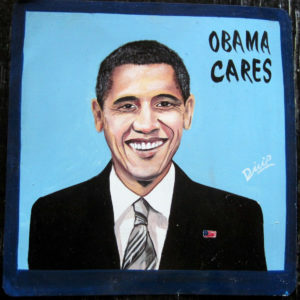 I had to tell Sufraj not to paint Obama as a white man…. When looking at a photograph of himself, Sufraj will shake his head and say ‘so dark’. I explained that it was historic that a black man was elected as President of the United States. In Nepal, one would say that he gave Barack the ‘Fair and Lovely’ treatment – ‘Fair and Lovely’ being a popular skin whitening treatment in South and Southeast Asia. Barack Obama was elected with great excitement all over the world. Nepal was no exception. The artists were happy to paint his portrait. I gave them a choice of 4 photos to paint and here are the results! All are enamel on metal except for one by Govinda which is on wood panel. All are available for $300. ampage1@gmail.com for more info. 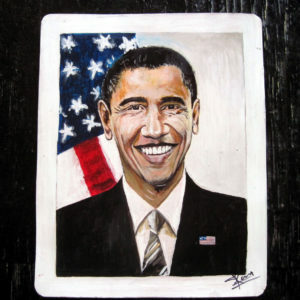 This handsome portrait of President Barack Obama is hand painted on metal by Dilip Niroj, a signboard artist from Kathmandu, Nepal. Available at Nomad – a store in Cambridge, MA, near Porter Square. 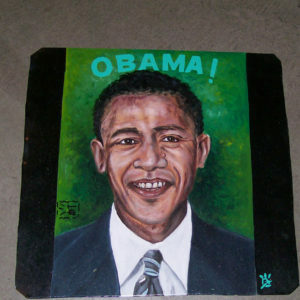 This folk art portrait of Barack Obama was painted on balsa wood, unlike the others. 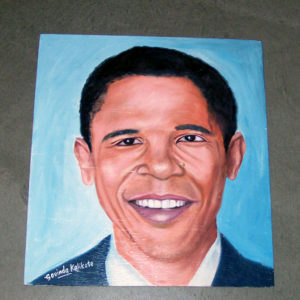 Govinda chose to paint Obama looking like a young basketball player. He also would not put wording on the art. 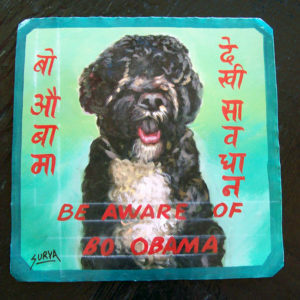 Megh Raj Thapa hand painted this portrait of Barack Obama on metal using synthetic enamel. 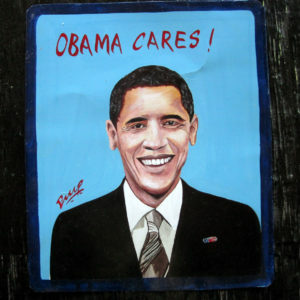 More than any other artist, Sagar painted Barack Obama in his own image, making Obama older and darker in complexion. Sanjib Rana hand painted this dramatic portrait of President Barack Obama on metal with a colorful backdrop of the American flag. 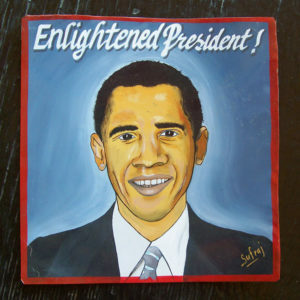 This portrait of an Enlightened Obama is by Sufraj Khadka. 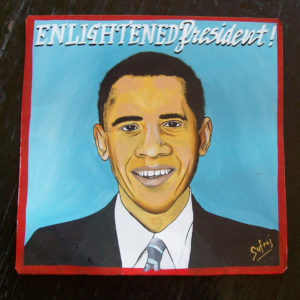 Painted in 2008, like all of the Folk Art Obamas, Sufraj painted Obama to look a bit like himself. Available at Nomad in Cambridge. 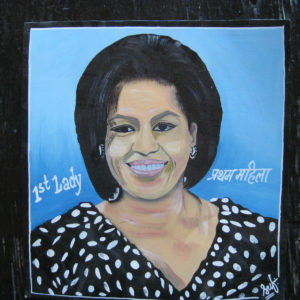 Folk art Michelle Obama hand painted on metal by a signboard artist in Nepal. She is wearing a polka dot dress. 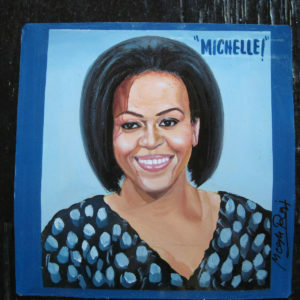 Michelle Obama is pretty in this folk art portrait (pre-bangs!) by Sufraj Khadka. 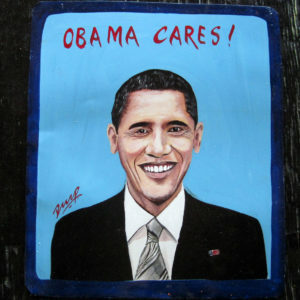 This is hand painted on metal in Kathmandu just before the 2012 re-election of her husband, President Obama. 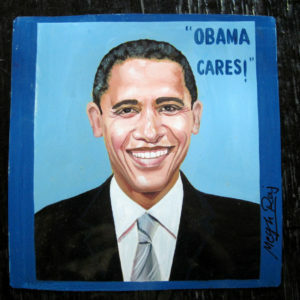 Dilip Niroj painted this portrait of President Barack Hussein Obama on metal using synthetic enamel. This painting is available at Nomad, a store in Cambridge MA. Their website is NomadCambridge.com. Here was a lovely wall at the Santa Monica Museum of Art in December 2008. Excitement was in the air that year. Some of the ones featured here are still available, but they look great en masse, don’t they?